where we share our questions, answers, business knowledge, lessons learned, and successes with one another! 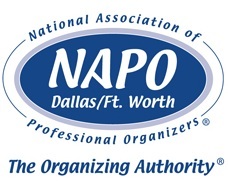 It is this kind of openness that makes NAPO and the NAPO-DFW chapter such a unique industry. Although at times we end up competing in the market, we all understand that by helping each other, we help the community. This is a closed meeting for Organizers instead of Organizers AND those “interested” in becoming an organizer and/or the industry. Your questions can be answered by anyone in the meeting versus a “panel” of 3 organizers. Dinner is provided to our Members! There are serious giveaways for our members!